Trenton's Mom sent in these comments about their test of the Little Bear Grizzly Snowshoes. 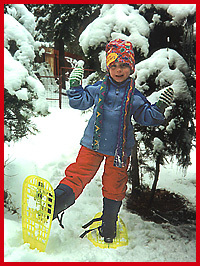 The snowshoes were tested around the North Shore of Lake Tahoe by Trenton, age five. Functionality: Overall the Little Bear Snowshoes seem to function just fine for a children's snowshoe. They work as they should and are relatively easy to use. Improvements: A bit of a problem with the bindings. They are supposed to be adjustable, but we were unable to unscrew the screws which adjust the boot size. We had a couple of different people try and they weren't able to budge the binding hardware either. Use: The Little Bear Snowshoes do what the manufacturer says they'll do. We could still use them, even though we weren't able to adjust the binding. They work well in deep snow as well as light snow. Durability: Very durable and stable. They seem like they will last a lifetime, will probably pass them down and be used for many of our families' generations to come! For more info on Little Bear Snowshoes see the Rippin' Rider Preview here. To buy a pair of Little Bear Snowshoes go to our KidzStore here.